You don’t always need to have a formal dining table to enjoy family meals together. In fact, having a formal dining table may be more of a nuisance than a help. 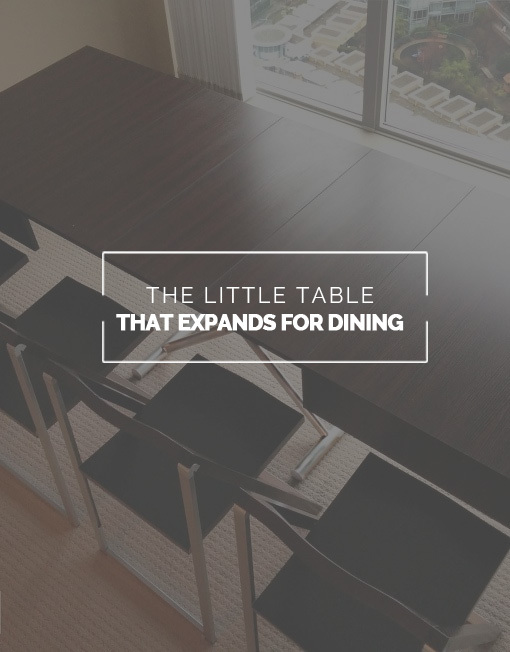 That huge table takes up a big chunk of real estate in your home during the day, preventing you from using the space for other reasons, such as exercising, home study, or even entertaining guests. Plus, it may be just you and your partner or you may have a small family, which means that you don’t even need that big table when you do dine. The Box Coffee to Dining Table looks like an unassuming coffee table when it is not in use. It has a modern design with a simple box shape that sits low to the ground, similar to an ottoman but in wood paneling rather than fabric. The style is perfect for contemporary homes. Hidden underneath the coffee table are chrome legs in a scissor formation. When you need to transform the coffee table into a dining table, you just raise up the table top as the legs elongate. Think of it the way you would a jack under a car, except you don’t have to wind it up; you just have to raise it gently with your hands. The two sides of the box table then pull out, revealing a space in the middle where you can insert matching eaves. After just a minute or two of your time, you will have converted the coffee table into a dining table that can comfortably seat 10 people. Putting the table away is as easy as it was to expand it. Just remove the eaves, close up the table top, and lower the legs. You don’t even have to move the table. The obvious benefits of this expanding coffee table include being able to take advantage of more of your space when you are not dining and easy operation. There are other space-saving tables available, but not all of them have the same ease of use as this box coffee table. Another great benefit of this table is that it is easy to clean. The glossy paneling only needs to be wiped down with a soft cloth to keep it free of dust. You don’t have to use furniture polish or protective oil, and you won’t have to re-stain it down the road. Depending on the finish you choose, the table is also water-resistant. You can spill drinks without worrying that you’ll leave behind a ring or warp the surface. Finally, the gorgeous design will instantly elevate the look of your living room or dining area all on its own. Expand Furniture offers a number of design options for the Box Coffee Table to Dining Table, including different panel and leg combinations. For the panel finish, you can choose wood tones like walnut, rustic, oak wood, grey wood and countryside oak. You can also choose black wood, but it comes with black legs instead of chrome. For a more modern look, you can choose panel finishes such as glossy white or glossy grey. The shiny panel will look perfect in a contemporary setting, including clean lines and simplistic design. You can preview all these finishes on the site, and you can order a custom panel if none of these suit your needs. 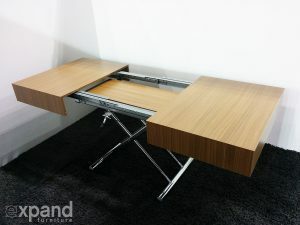 Expand Furniture offers numerous space-saving furniture options besides the Box Coffee to Dining Table. You can browse options for other expanding coffee tables, or you can look at wall beds, modular wall shelves & storage systems, and storage beds. All of our furniture is designed to create a gorgeous look for your home while also helping you to maximize your space. The best materials and the highest quality of craftsmanship are used in every piece so that your investment lasts you for many years to come. Explore our catalog to find the furniture you need.